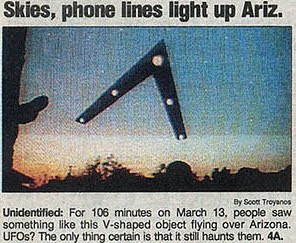 The Phoenix Lights was a strange phenomenon appearing over Phoenix in Arizona in 1997. Many associated the mysterious lights with UFOs and aliens. Arizona government Fife Symington ridiculed the UFO true believers during a notorious press conference, but years later, the now ex-governor admitted that he had seen the Phoenix Lights himself!